A soaring and heartfelt story about love, forgiveness, and how innocence makes us all rise up. 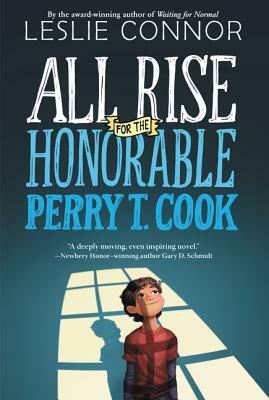 All Rise for the Honorable Perry T. Cook is a powerful middle grade novel, perfect for fans of Wonder and When You Reach Me, from Leslie Connor, the award-winning author of Waiting for Normal and Crunch. From comes Eleven-year-old Perry was born and raised by his mom at the Blue River Co-ed Correctional Facility in tiny Surprise, Nebraska. His mom is a resident on Cell Block C, and so far Warden Daugherty has made it possible for them to be together. That is, until a new district attorney discovers the truth—and Perry is removed from the facility and forced into a foster home.